Job’s Daughters International™ is a leadership organization for young women ages 10 to 20. Job’s Daughters is a premier organization for young women that provides a wholesome environment based on the foundation of high morals, love of country, love of family and friends and respect for others throughout the world. See more from the Job’s Daughters International website. See which Bethel is closest to you here. Download a petition for membership by clicking here. College-bound members of Job’s Daughters are welcome to apply for scholarships through Job’s Daughters and other Masonic groups. 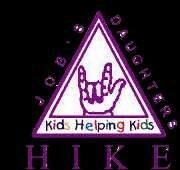 Hearing Improvement Kids Endowment (HIKE) is the charity of Job’s Daughters International™. The HIKE Fund Inc. is a non-profit charity registered with the Internal Revenue Service as a tax-exempt charity. The HIKE funds devices for the hearing impaired including Hearing Aids, FM Systems, Closed Caption Converters, Tactile Units, Alerting Systems, and Specialized Sports Equipment. Total operating expenses are less than 5%. If you know of a child who needs a hearing assistive device and is financially unable to obtain assistance, please contact us. The purpose of the JDI Youth Protection Program is to provide an environment to support the growth and safety of the young women in Job’s Daughters. To help create this environment, adult volunteers will be provided with detailed training and pass a screening process to help ensure the safety of our youth. Questions regarding the Youth Protection Program and Certified Adult Volunteer Training should be directed to the Youth Protection Program Coordinator at jdiypp.coord@gmail.com.